Bunker Silo Facers – worth the investment? Bunker silo facers are a form of silage unloader. They are frequently constructed as teeth attached to a drum. The drum is mounted on a boom attached to a power unit (skid steer, tractor, telehandler, etc.) The drum is rotated while unloading and is often driven by a hydraulic motor. The rotating drum is drawn down the face of the silage in a bunker or pile. The teeth remove the silage stored in the bunker. The silage remaining in the bunker has a smooth face with a relatively low exposure to oxygen. The facer is an alternative to a front-end loader which is the most common piece of equipment for removing silage from a bunker face. Even with good management, it is difficult to leave a relatively smooth face with a front-end loader. All too often, the front-end loader operator leaves a rough face with deep fissures in the silage. This exposure to air can cause major losses (up to 10%) on these faces. What is the difference in loss between using a front-end loader and a facer? The difference in loss between that obtained by the front-end loader and the facer will be influenced by many factors, from how the forage was ensiled to how it is removed. 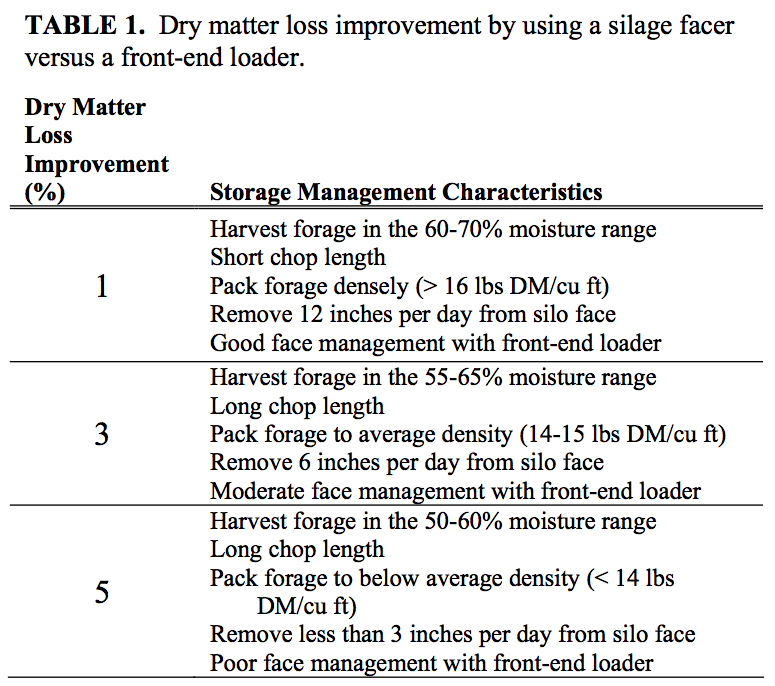 An estimate of dry matter loss differences, based on silage management, is listed in Table 1. These estimates presume the dry matter loss differences are higher as fewer recommended practices for silage management are followed. Can a producer justify the investment in a bunker silo facer? To answer this question, a spreadsheet has been developed to establish the break-even cost that one can use to compare to the actual cost of a facer. This spreadsheet was used to develop Tables 2 to 4. A producer can afford to spend less than the break-even cost and maintain profitability. The break-even cost of the facer when converted to an annual cost equals the sum of improvement in dry matter loss value, additional labor, additional equipment, and additional fuel use costs. The labor, equipment and fuel use could actually be savings if the facer operates at a faster rate than the front-end loader. 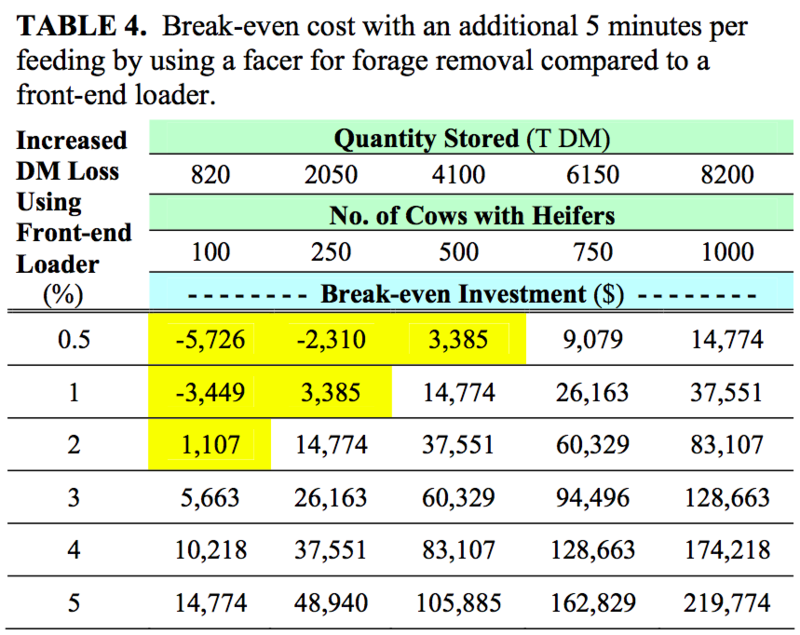 In Table 2, the front-end loader and facer are assumed to remove silage from the bunker at the same rate. The forage is valued at $100/T DM. There will be no additional cost or savings for labor, equipment or fuel use. A smaller facer may cost between $3,500 and $5,000. From Table 2, a producer with a small amount of forage and using good management (1% DM loss difference) will break-even with the cost of a smaller facer. Larger producers or those with less good management will have significant profits by investing $4,500 for a facer. For example, a producer with 2,050 T DM stored and improving dry matter loss by 3% would have a $29,667 ($34,167 – $4,500) profit over a 10-year period or $2,967/year. If the facer saves 5 minutes per feeding, there will be labor, equipment, and fuel savings. 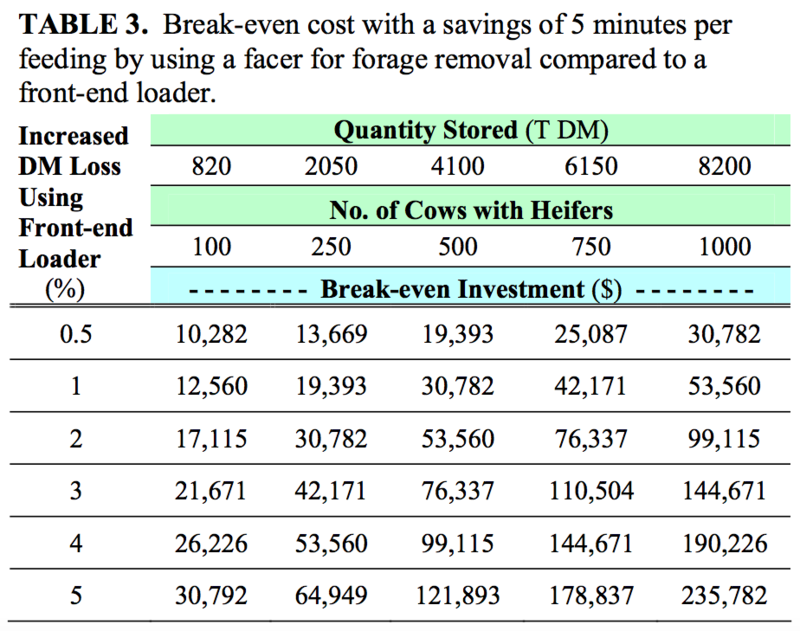 With $10/hr labor cost, two feedings per day, $10/hr ownership cost for a 60-HP power unit, fuel at $1/gal, and the power unit operating at 75% of capacity while facing, the break-even costs are listed in Table 3. Here the time savings for a face cutter push the break-even cost well above the $4,500 cost of a smaller face cutter. This shows the importance of knowing if time savings will occur by using a face cutter. If the facer requires an additional 5 minutes per feeding over a front-end loader, there will be additional labor, equipment, and fuel costs to decrease the break-even costs. 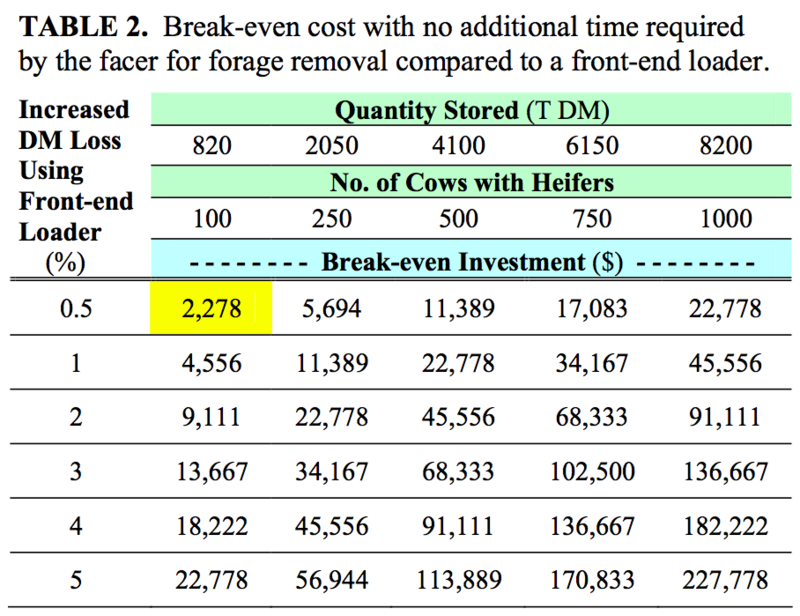 With the same assumptions used previously, the break-even costs are listed in Table 4. In this case, smaller producers using good to moderate management practices cannot justify an investment of $4,500 because it will be greater than the break-even cost. Others can still justify the investment. This points out the importance of knowing if feeding time will be greater with a facer versus a front-end loader for smaller operations. Are there any other additional benefits to using a facer? Particle size is not reduced.